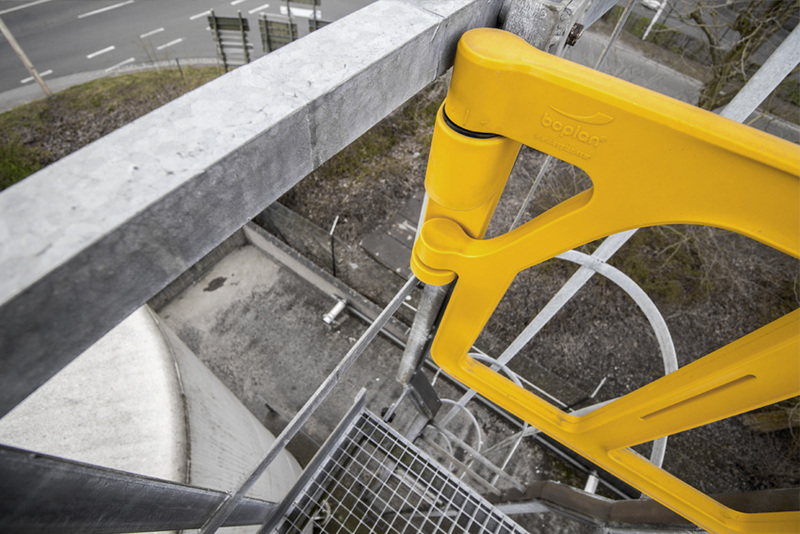 The industrial safety gates in the AXES GATE series were the very first Boplan product. In many sectors, falling from a considerable height is a real possibility. The consequences of such falls can be catastrophic: serious injury, long-term disability and in the worst case even death. Personal suffering generally cannot be compensated by damage claims. The consequences for the employer should not be underestimated either. The production process will encounter considerable delays and may even be shut down. Time-consuming labour inspections follow in the wake of such incidents. Your company risks damage to its reputation, you lose precious time, and costs rise through the roof. That is why you need to prevent such situations by investing in solid, robust fall protection – such as the single or double AXES GATE. Over time, our industrial safety gates have been perfected down to the smallest details. Our industrial gates in the AXES GATE series are the result of 15 years of continuous production experience, which translates to perfection in the tiniest details. The Double AXES GATE is EN 14122-3 and 14122-4 compliant, making it an exceptionally impact-resistant industrial safety gate. Our AXES GATE safety gates can easily withstand an impact of 100 kg. These industrial safety gates are manufactured from flexible plastic. At the slightest impact, they bend and then return to their original shape. The AXES GATE shows no dents or cracks, as we often see in the classic iron and steel safety products. The AXES GATE is very easy to install. Once installed, you never will need to maintain the AXES GATE. Our industrial safety gates are self-closing. This is an important safety advantage, since a co-worker might forget to close the gate manually after going through. Free safety tips! Win back your peace of mind, thanks to our latest insights and advice. BOPLAN® designs, develops and produces durable, highly efficient fall and impact protection made from synthetics. Protection for people, vehicles, buildings and infrastructures is the main priority.